For many years cost effective seat reservation solutions had been reliant on the use of the traditional pre-printed paper reservation slips that were placed on each individual reserved seat. Advances in display and train to shore communications now means that fully automated seat reservation can be considered a cost effective solution for all types of rail passenger use, even for commuter journeys. 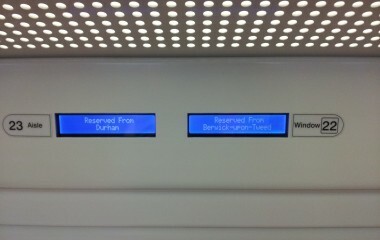 Our Seat Reservation systems provide an at-seat display for each reserved seat. Based on “always connected” GPRS train to shore communications, uploads of changes to the train manifest can be carried out automatically at any point in the journey. We can provide seat reservation systems that will operate over existing train wires or over dedicated Ethernet networks. We offer a fully compliant seat reservation system with LCD displays (various colours) and real-time interfacing with ATOS.